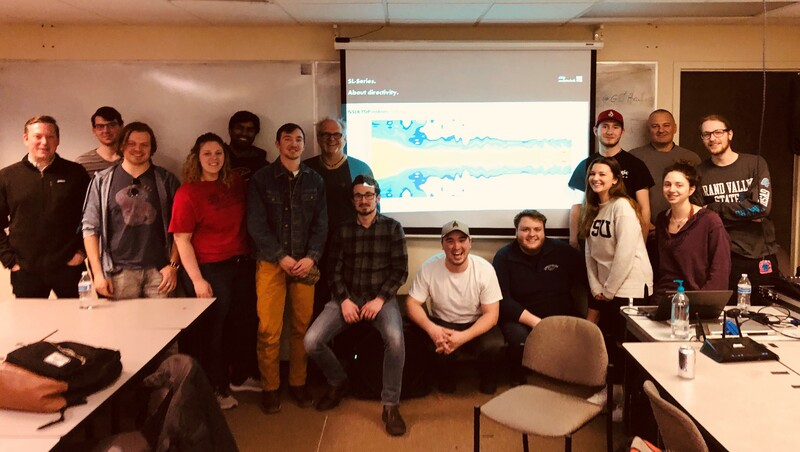 d&b Audiotechnik, a major manufacturer for professional PA speakers and audio systems, recently came to campus to speak with a systems engineering course. The organization’s lead designers Vier and Matthias were in attendance and shared their insights with students. Fresh off their NAMM visit for the release of their newest PA, KSL-8 and KSL-12, the duo explained the technology behind their work. The visit ties in with one of Belmont’s upcoming Maymester trips to the D&B factory in Backnang, Germany. Belmont graduate and local D&B rep Jeremy Seawell, who helped arrange the visit, was also on hand for the presentation.